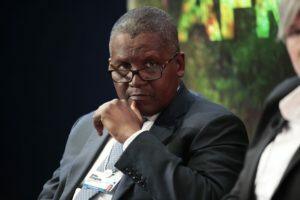 Dangote Group, controlled by Africa’s richest man, Aliko Dangote, plans to invest $20bn to $50bn in the United States and Europe over the next seven years in various industries, including renewable energy and petrochemicals, Bloomberg reports. Dangote, whose cement unit is Nigeria’s biggest listed company, will start investing outside the African continent by 2020. In an interview with Bloomberg Markets Magazine this month, the cement tycoon said Dangote Group’s major investment will be in the US and Europe from 2020. “Beginning in 2020, 60% of our future investments will be outside Africa, so we can have a balance,” the business mogul said. “Renewables is the way to go forward, and the future. We are looking at petrochemicals but can also invest in other companies,” he said. Dangote Group has been investing in agriculture in his home country, as Africa’s most populous nation seeks to diversify away from oil, which accounts for 90% of its export earnings and the bulk of revenue. The economy, which plunged into its first recession last year, is expected to expand by 1.2% this year, according to the World Bank. Dangote Group plans to cultivate 350,000 hectares (864,850 acres) of land for sugar cane and add 200,000 hectares for rice, according to the executive director. Aliko Dangote, 60, has a net worth of $11.6bn, according to the Bloomberg Billionaires Index. Posted by Khalid Al Mouahidi on August 17, 2017. Filed under Business. You can follow any responses to this entry through the RSS 2.0. You can skip to the end and leave a response. Pinging is currently not allowed.